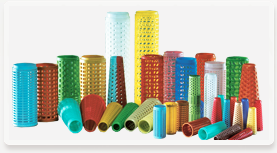 Our Speciality : Moksha Thermoplastics Pvt. Ltd. The focus of the technological competence at Moksha has roots in the area of High temperature Yarn Carrier technology. The efficiency of each production step where yarn is processed depends strongly on the Quality of the supply bobbin. For us, at Moksha, to achieve top performance it is very important to know the requirements of the downstream processes to optimize and design these bobbins accordingly. The result is a variety of bobbin formats and tailor made solutions for Yarn & Package Dyeing machines. We use a common philosophy as these tools enable the customer to produce valuable products. Involvement in the development of composite-nanocomposite blends to take advantage of the properties of individual components as well as their synergy has given Moksha the Leading Technology Edge. into this High tech HDPP Polymer. Thermal ( enthalpy, thermal capacity, crystallization kinetics ). Thermodynamics ( PVT behaviour, equation of state, liquid and gas permeability ). Short- and long-term mechanical behaviour ( stress- deformation, fatigue life, fatigue-propagation, low- speed impact, durability, fracture behavior ). ( orientation, distribution & interaction of the nanoclays ). Excellent chemical resistance and Minimal Staining properties.